The tuba euphonium studio at Arizona State University has a rich history of student successes. It is comprised of talented, vibrant students who are self motivated and who continually inspire each other to new levels. The students major in a variety of fields, including music performance, music education, composition, and music therapy. 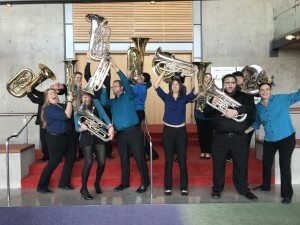 In addition to private lessons students participate in weekly studio classes, tuba euphonium ensemble, chamber music, and band or orchestra ensembles. Check back often for updates, or come visit us at Arizona State University. And, please visit our ASUTubaEuph YOUTUBE channel. We look forward to meeting you!